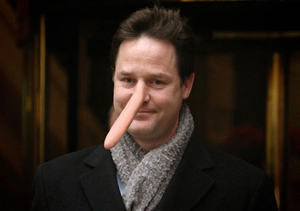 How long can the Lib Dems claim their tax policy helps the poorest? Next time you see Nick Clegg or Tim Farron emoting about the Lib Dems’ concern for the poorest, remember: the priority for them is income tax cuts, write Tim Horton & Howard Reed. In her comment piece in today’s Times, Rachel Sylvester seems to have swallowed a bucket-load of Lib Dem spin. The article is behind the Times paywall (£), but the gist is as follows: behind the scenes, the saintly Nick Clegg and his brave band of Lib Dems are fighting the evil Tories to force them to focus on the poorest in society by raising income tax thresholds. Let’s leave to one side the question of how long the Conservatives will let the Lib Dems keep painting them as a ‘nasty party’ to be tamed by their coalition partners (John Redwood recently described this as “one of the things I do not like”). What is more interesting to see is how long the Lib Dems can get away with claiming that they and their tax policy are motivated by a special concern for the poorest. The Times repeats the Lib Dem mantra that raising the personal allowance is “taking the low-paid out of tax”. But it isn’t. The low-paid are currently getting hammered by VAT and a range of other taxes. 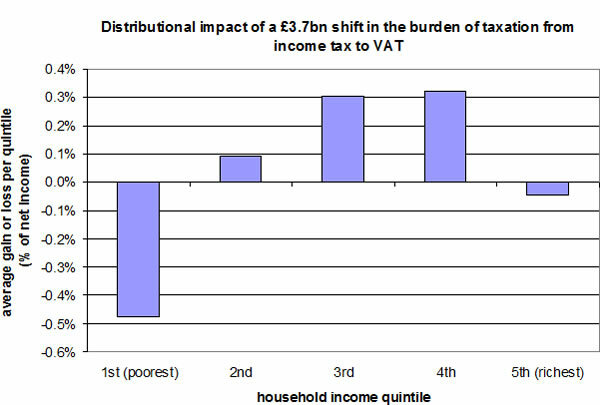 VAT hits the poorest so much harder than income tax because, while income tax is progressive (the tax burden rises with your income), VAT is regressive. By cutting income tax at the same time as raising VAT, the Government are shifting the burden of taxation in a way that makes our tax system less progressive. To illustrate, the graph below shows the distributional impact (by household income quintile) of the government’s recent increase in the income tax personal allowance (costing £3.7bn) combined with £3.7bn-worth of VAT increase (which represents about a third of the total VAT increase to 20%). In other words, this shows the impact of a £3.7bn tax shift from income tax to VAT. On average, households in the poorest 30% of the population lose from this tax shift. As the graph shows, households in the poorest fifth are big losers, while households in the 3rd and 4th quintiles are significant gainers. So the effect of this tax shift is significant redistribution from the low paid to the higher paid. The reality is that most low-paid households would have been far better off if, rather than cutting income tax, the Conservative-led coalition had spent the available resources lessening the VAT rise. One of Margaret Thatcher’s legacies from the 1980s was a much more unequal Britain; as Professor John Hills has shown, one of the main causes of this was a large shift in the burden of tax away from income tax and towards VAT. The Liberal Democrats are now driving forward this Thatcherite agenda once more. Sylvester expresses surprise in her Times piece to find that George Osborne “is a big fan of raising the [income tax] threshold”. But she shouldn’t be surprised; it has long been a Tory fantasy, promoted by Maurice Saatchi and Norman Tebbit (though rejected by more moderate Tories like David Willetts). One reason why this tax shift is so regressive is that raising income tax thresholds isn’t a very good way of helping low-income households (for more on this, see our report from March 2010). Only 6% of the cost of increasing the personal allowance is spent on the Lib Dems’ stated aim of lifting low-income households out of income tax; the remaining 94% is a whacking great tax cut for the rest of us. And, of course, an income tax cut does nothing for some 3 million households in the poorest quarter of the population who do not have income high enough to pay tax – including many pensioners and parents juggling childcare with part-time work. If the Lib Dems and Tories were really motivated to stop those on low incomes having to contribute to the exchequer, they could do this for far more low-income families by putting the same resources into extending and increasing tax credits, than they could by raising income tax thresholds. The introduction of tax credits by Labour dramatically increased the number of low-income families paying no net tax (and brought about huge reductions in effective tax rates for millions of families – on a scale that dwarfs the effects of increasing the personal allowance). Finally, what about the effect on public services? No-one minds a middle-class tax cut when we can afford it, but we are currently in the midst of the deepest welfare and public service cuts in living memory. And the coalition’s tax cuts are making these spending cuts far deeper than they need to be. Yet there has been no public debate about whether or not the resources should instead be used to stop cuts to frontline policing, retain Building Schools for the Future, or provide better equipment for our troops in Afghanistan. No wonder the Lib Dems are trying to stick to the bogus claim that these tax cuts reflect some special concern for the poorest. Over the next year, we are going to see schoolchildren taken out of schools as their families are forced to move due to Housing Benefit cuts; disabled people trapped in care homes and unable to see their families because of DLA cuts; and single parents forced to leave their jobs because of cuts to financial support with childcare. Next time you see Nick Clegg or Tim Farron emoting about the Lib Dems’ concern for the poorest, remember: all of these personal and social tragedies are less of a priority for them than income tax cuts.